Basketball games are played in an open environment. This means the environment is variable and unpredictable during the action. Skills and tactics are not repeated in exactly the same way because of the changing environment. Many basketball drills are not game-like because they take place in a closed environment. This causes players to think about skills and tactics in a way they are not used in a game. A games approach to coaching can help a coach create a game-like environment that leads to increased learning, retention and transfer to games. There are three methods to help a coach structure game-like situations so that players learn what they need to know to play well. The three methods are shaping, focusing and enhancing play. My goal is to stimulate your thinking about how you coach basketball. So if you use a lot of drills take a moment to reflect on what happens in a drill where the coach has control? Traditional drill-based basketball coaching breaks the game into smaller parts and teaches skills in a variety of drills. The hope is that the smaller parts developed in drills will then be executed in scrimmages and games. While there is value to all teaching, the potential shortcomings of drill based coaching is that the skills and tactics you break into smaller parts don’t transfer into the games. Repeated practice of a technical or tactical skill through drills can also lead to an overemphasis on technical skills and direct instruction. So what’s wrong with that? Isn’t technical skill development through ‘coaching” the cornerstone of what we do as basketball coaches? The problem is that direct instruction cannot happen the same way in a game as it can in practice. And most games, putting equal levels of competition against each other, are more impacted by decisions than skills. My conclusion from all I have learned and experienced in coaching is to use drills that are closely aligned with the game to teach technical and tactical skills. Your practices will look very different from using drill based content. Players are involved in solving their own problems. Players are more engaged as they are playing the game. Coach-centred drill oriented practices are often boring and consequently less engaging for the players. Players develop increasing freedom from the coach by being actively involved in the learning process. Players are allowed to give input to the coach and help the coach make decisions. For more information on using a games approach to coaching I suggest checking out this blog by Nick Hill @NH_Coaching_ shared on SportIQ: Why use ‘Teaching Games for Understanding’ (‘TGfU’) in your Teaching/Coaching…? Here is an example of how I use a scripted starting point to structure game-like learning. 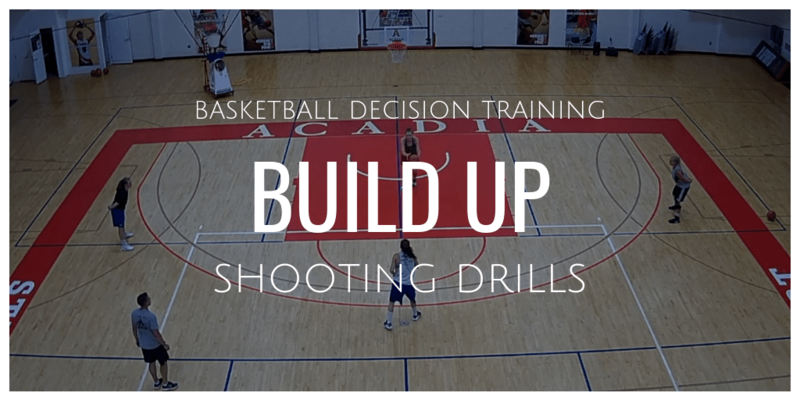 The scripted drill is a Blind Hand-Off, and it is combined with multiple full-court trips to teach basketball skills and tactics. HOW I APPLY A GAMES APPROACH IN MY PRACTICES? One of the most common drills you will see in my practices is a drill that begins with a scripted started, followed by live play. The scripted start allows me to focus on areas of improvement or development. The live play allows our players to experience the game. It also presents many teachable moments within the context of the game. When you plan practice using scripted to unscripted drills, first identify what you need to work on. By identifying the purpose of the practice game you will then be able to choose a practice game that meets your needs player and team development needs. Identify the purpose of the practice game. To improve offensive penetration reaction, passing and getting a positive scoring opportunity out of an advantageous situation. To develop the defensive principles of the baseline or middle help defense, and defensive rotation and recovery. To work on offensive and defensive transition concepts with multiple trips of the floor. To intervene with whatever offensive or defensive game situations occur during the full-court competitive trips. For this example, I chose Blind Hand-Off as the practice game. Blind Hand-Off can be used to start any small-sided game, 5-on-5 situation or 1-on-1 play. Why use a blind hand-off to start play? Since we want to work on offensive and defensive reactions to penetration, we want to quickly create an opportunity for players to practice those game situations. The blind hand-off ensures there is an initial penetration due to the offensive advantage. If we played 5-on-5 without a scripted start, we could not guarantee a dribble penetration would happen. The defense could prevent the dribble penetration. This is just one example of many that we could use to create this initial advantage. Decide how you are going to shape, focus and enhance game play. Starting multiple trips from a blind hand-off is an example of structuring game-like situations so that players learn what they need to know to play the game. A blind hand-off can be used in a basketball practice to create an offensive and defensive reaction a coach wants to develop. The blind hand-off becomes the starting point to three 5-on-5 trips. The blind hand-off is set-up to give the advantage to the offense. The initial advantage forces a defensive reaction. After the initial hand-off the action is live…whatever happens, happens. Teachable moments, game situations and skill applications can all be coached during this competitive challenge. Here is how we set-up and coach blind hand-off into multiple trips. We do not just roll out the balls and let our players play. We use coaching interventions in a drill like Blind Hand-Off to focus the play of our players. Our players know our commands for communicating during play. To stop the play to teach we call “Foul.” To teach during the stoppage and focus the players on what needs to be learned we use additional communication cues. “Recreate” is used to rewind the play back to the situation that requires an intervention. We use “Remind” to get players re-focused on a concept that is important but is repeatedly not being applied. The key word is repeated as we don’t want to take away from the play for a one-time mistake. We want to correct repeated mistakes. If required, we also use this period to “Demo.” The demonstration is used to clearly show players something they are having a hard time conceptualizing. The other value of the demonstration is that by using players you are making them active participants in the learning process as they cooperate in teaching something to themselves or their teammates. Using a games approach requires a leap of faith? Using a games approach to coaching is challenging. I have used these concepts for many years and I still leave practice sometimes with some doubts. The doubts relate to whether or not we accomplished what we wanted to in practice. This mostly relates to the fact that the practice is messy and less organized so it is more difficult to assess its impact. When you do mass drill-based repetitions players look like they are getting better as the drill progresses, both within the practice and from day to day, because the drill is more organized. In a games approach to coaching the complexity of the games interferes with the players’ ability to apply skills and tactics. As practice progresses players are gradually able to increase their application of the skills and tactics. In my opinion the struggles you will go through in switching to more of a games approach to coaching will be worth it. Player satisfaction with practice will increase, and I believe your enjoyment as well. For more information on our philosophy of coaching with a games approach to coaching and small-sided games please check out A Practical Guide to 3-on-3 Small-Sided Games in Basketball. Become a member of our Basketball Immersion coaching community for $8.25 per month…Membership Math.